When you hear "Super Bowl," you might think of the big game playing out on your TV screen. But there's a sizeable football culture that unfolds on YouTube too—before, during, and well after kickoff. Check out the three football content trends we're currently following on YouTube. Whether you're a die-hard fan or just in it for the chicken wings, football culture undeniably brings people together. Time and again, we see this play out on YouTube in the way people consume football content. Football-related watch time on YouTube has grown over 90% year over year.1 Think that's all replay videos? Think again. 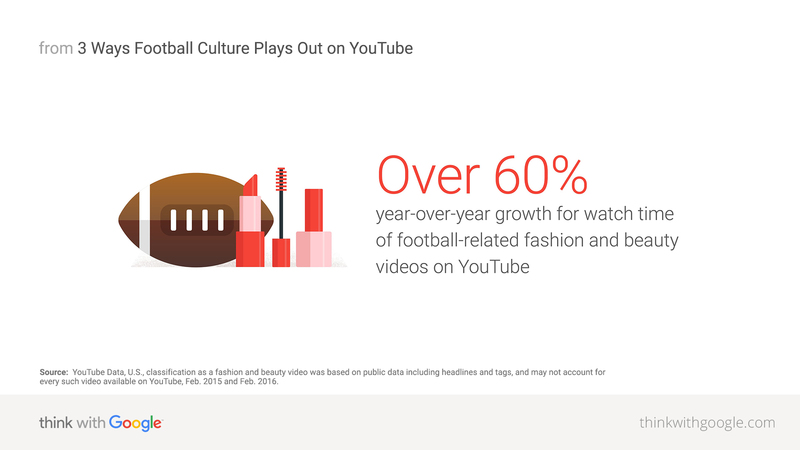 Here are three football video content trends we're tracking on YouTube. Source: YouTube Data, U.S., classification as a fashion and beauty video was based on public data including headlines and tags, and may not account for every such video available on YouTube, Jan. 2014–Nov. 2016. Source: YouTube Data, U.S., classification as a fashion and beauty video was based on public data including headlines and tags, and may not account for every such video available on YouTube, Feb. 2015 and Feb. 2016. Which team inspired the most spirit in 2016? In 2016, the team with the most football-related fashion and beauty videos was the Super Bowl XLVIII champion Seattle Seahawks.3 Something about action green must make people want to wear it. 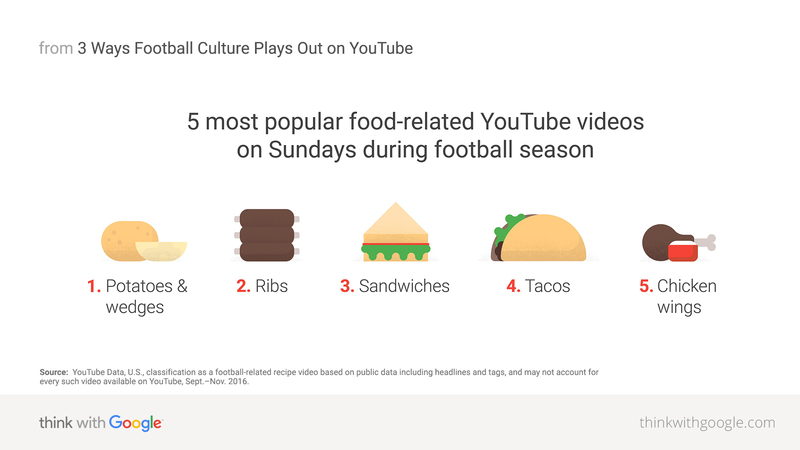 Source: YouTube Data, U.S., classification as a football-related recipe video based on public data including headlines and tags, and may not account for every such video available on YouTube, Sept.–Nov. 2015 and Sept.–Nov. 2016. What are the most popular football recipe videos on YouTube? Source: YouTube Data, U.S., classification as a football-related recipe video based on public data including headlines and tags, and may not account for every such video available on YouTube, Sept.–Nov. 2016. Check out some of these popular (and mouth-watering) game day treat videos. Source: YouTube Data, U.S., classification as a fantasy football video based on public data including headlines and tags, and may not account for every such video available on YouTube, Jan.–Nov. 2015 and Jan.–Nov. 2016. Where is fantasy football catching on most strongly? Check out the states with the most watch time per capita for fantasy football-related videos. What kinds of fantasy football-related videos are people tuning in to? Commentary, recaps, predictions—the gamut. Check out popular YouTube creators Dude Perfect as they take a break from their trick shots to talk fantasy football. What does all of this mean for brands eager to reach football fans? Football culture on YouTube runs deeper than game highlights and replays. And it lives beyond (and before) game day itself. The growth in football-related watch time proves that viewers are eager to engage in football-related content. And brands are finding ways to reach people while they're there, as well as creating content to keep them coming back for more. 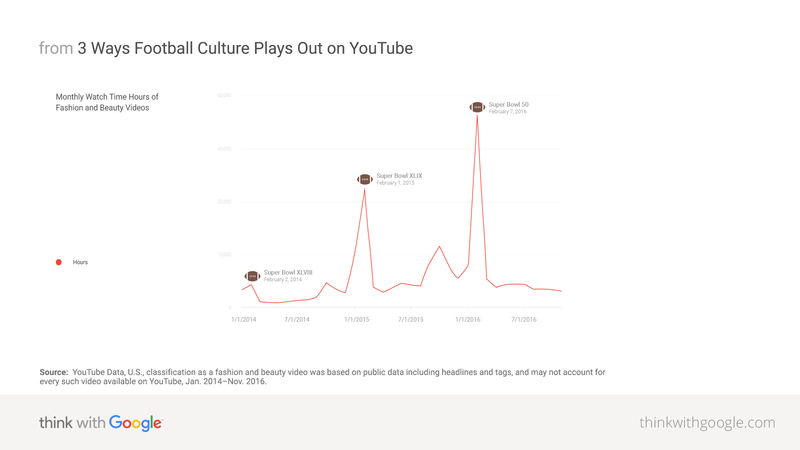 1 YouTube Data, U.S., classification as an American football video based on public data including headlines and tags, and may not account for every such video available on YouTube, Jan.–Nov. 2016. 2 YouTube Data, U.S., classification as a fashion and beauty video based on public data including headlines and tags, and may not account for every such video available on YouTube, Jan. 2014–Nov. 2016. 3 YouTube Data, U.S., classification as a team make-up and outfit video based on public data including headlines and tags, and may not account for every such video available on YouTube, Jan.–Nov. 2016.